Over the phone our customer told us that the fire would light normally but would shut down after a few minutes and that there was a long flame coming up from the pilot. He said the fire hadn't been serviced in 6 years. This was not a difficult fault-find. When we took the front off the fire we found that the pilot lint arrester filter was completely covered in fluff. What the fire needed was a good service. After servicing it all worked fine. Precision pilots are designed to shut down the gas fire if the supply of oxygen to the pilot burner becomes depleted. Other names you'll hear are atmospheric sensing device (ASD) and oxygen depletion sensor (ODS). We prefer "precision pilot" because it describes how it works. As far as we know all these terms refer to very similar safety devices. Precision pilots are also used on open-flued (chimney type) gas boilers. This is more pronounced in back boilers with front fires which use the same type of pilot; back boilers require far more air and so draw in much more dust and fluff. The rooms in which back boilers and gas fires are located are commonly carpeted, producing more fluff, and often inhabited by long-haired, fluffy pets as well as people. The long flame our customer saw coming up from the pilot was the upper tongue of flame. Normally it is short and sharp and points upwards and forwards to light the main burner but it had become long and soft and was tending to miss the main burner. This can make the fire light more explosively and may deposit soot on any surface it touches. To stay sharp, the pilot flame requires an adequate supply of air, containing the correct amount of oxygen. 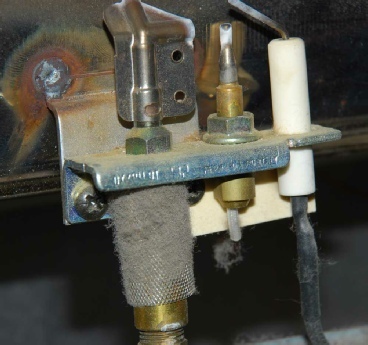 If the air supply to the pilot burner is reduced the pilot flame loses its sharply defined shape. It becomes softer and more dispersed, with the gas molecules having to spread out further to find oxygen molecules to react with. This softer flame lifts upwards more, no longer covering the thermocouple tip. The thermocouple cools, no longer supplying power to the electromagnet which holds the gas valve open, and the valve shuts down safely. In the very rare event that the oxygen in the room air becomes depleted the shape of the pilot flame will again become less precise and again the thermocouple will cool, shutting down the gas valve. Nearly always, however, the shape of the precision pilot flame changes because the lint arrester filter is clogged or because the small holes allowing air in to the pilot burner are becoming clogged with dust. Gas fires of this type draw their air for combustion, and for dilution of the flue gases, from the room. As the air is drawn towards the fire it brings with it dust and fluff from the floor surface. The pilot burner is designed to produce a small, sharp flame with two tongues. One points towards the main burner, to light it when the gas to the main burner is turned on; the other tongue precisely covers just the tip of the thermocouple.